Though the Astoria to Zion release date isn’t until March, we thought we’d get in the giving spirit a little early. 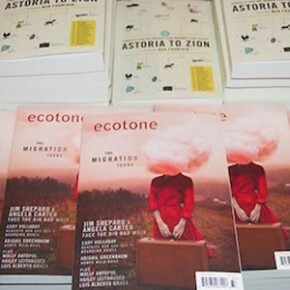 What better way to introduce readers to the best of Ecotone than a taste from each story? Every Monday over the next several months, we’ll post the first paragraph from a featured story in the collection. So look for the series every Monday and be sure to check our blog for additional updates. Excerpted from “The Blue Tree” from Astoria to Zion: Twenty-Six Stories of Risk and Abandon from Ecotone’s First Decade . Copyright © 2014 by University of North Carolina Wilmington. Used by permission of Lookout Books. All rights reserved. No part of this excerpt may be reproduced or reprinted without permission in writing from the publisher.